Although it now is lost to time, in its brief existence, The Aviation Country Club of Detroit played an interesting part in Michigan history. 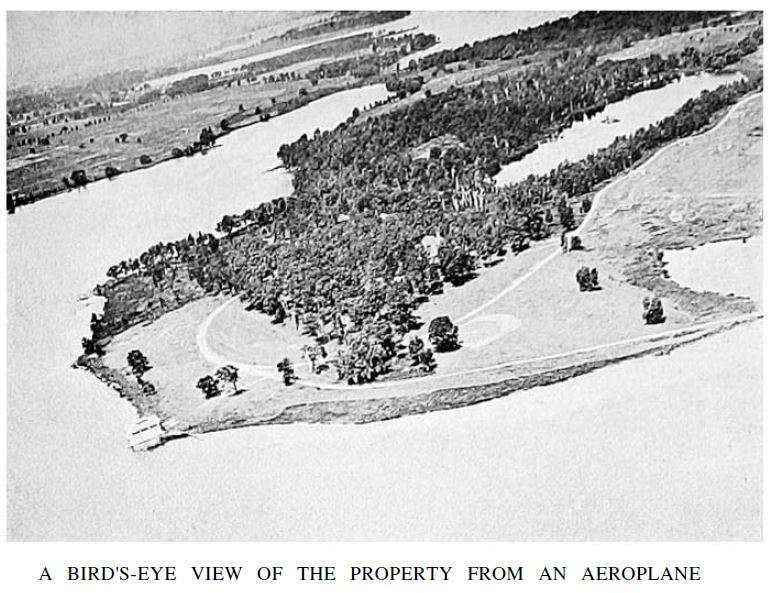 Instead of having a meagre (sic) one hundred and ten acres, as a number of metropolitan courses have, this new organization, the Aviation Country Club of Detroit, has eight hundred and fifty acres? Can any one who has not seen the property imagine what a golfing paradise that will be? Just conjure up in your mind for a moment the joy of suddenly finding yourself in the middle of this huge estate with everything in readiness for a game and sense the feeling of relief to know that no matter how long a driver you are you cannot put a ball out of bounds with one shot. The Aviation Country Club was built on property previously owned by Walter Flanders (1871–1923), a machinery salesman who was hired by Henry Ford in 1906. Although Flanders stayed at Ford for less than two years, he was instrumental in laying the groundwork for the modern assembly line. He would go on to head several automobile companies, including Studebaker, Maxwell and the United States Motor Company. Flanders moved to Virginia in 1919 and sold the property to the club in 1920. 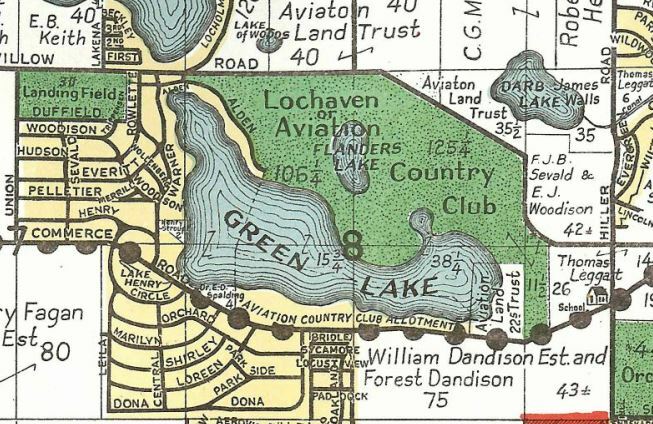 The Greater West Bloomfield Historical Society, has a map from 1930 (below) showing the location of the Aviation Country Club on the north shore of Green Lake on what is now known as Bloomfield Polo Estates and Green Lake Heights. Flanders Lake, presumably named for William Flanders, is at the center of the property. Detroit used to claim as one of its first citizens a multi-millionaire by the name of Flanders, among whose hobbies was country estates. 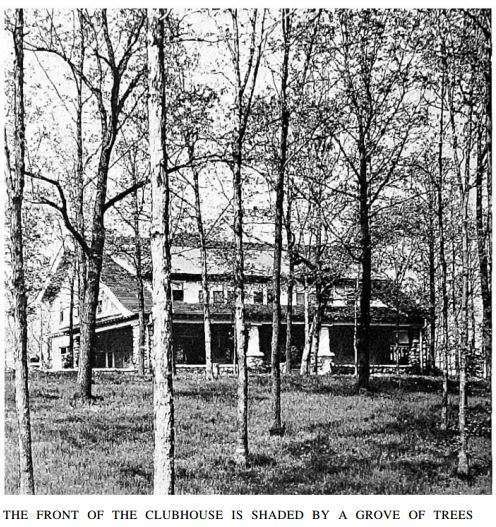 He discovered this tract of land about thirty miles northeast of the city, one one of the main arteries of Michigan’s motor roads; the beauty of the property did not fail to appeal to him and in it, he saw an opportunity to realize his dream of a country place. Four small lakes furnished an enhancing contrast to the plentifully wooded valleys, where all kinds of trees and shrubs abound, thus affording an ideal background for a house built on very generous lines. Nothing was spared in perfecting his plans. The house was built large enough to entertain extensively and to accommodate many guests overnight. There is a huge dining room on the main floor; also a commodious lounge. The first floor is devoted to sleeping quarters, where over fifty guests could be taken care of amid interior decorations that are the last word in that art, and t h e r e are numerous bathrooms and showers. Glass enclosed balconies flank two sides of the clubhouse and these are furnished just as luxuriously as the other main rooms. The club’s course was laid out by Herbert Strong. Strong was an accomplished golfer who was the first Secretary-Treasurer of the PGA of America, and who finished as high as ninth in the 1913 US Open. Strong designed at least thirty other clubs, including Saucon Valley Country Club, Old course, which was the site of the 2009 U.S. Women’s Open, 2000 U.S. Senior Open, 2009 U.S. Senior Open and 1951 U.S. Amateur. It is the custom of late to announce when every new course is projected that it will be one of the best in the country. In this particular instance, however, I deem the prophecy a perfectly safe one. The course will certainly be a very welcome addition to those generally considered for national championships in this country, for it is so natural that with one or two exceptions no artificial bunkering will be necessary. Every course has some holes that seem to stand out above the rest. They are the classics of the golfing world. They are spoken of in great reverence. The Aviation Club has two of this kind, the eleventh and the fifteenth. The eleventh is only three hundred and seventy-five yards and a par four, but it is going to be a real test of every shot played. From the tee at the edge of the lake it looks as if one could drive the green, but the longest way round is often the shortest way home, and this is very true in this case. The fairway skirts the shore of the lake even when it turns abruptly in elbow fashion. Just at the turn is a slight rise. Long drivers will usually get over that rise, but others will not. 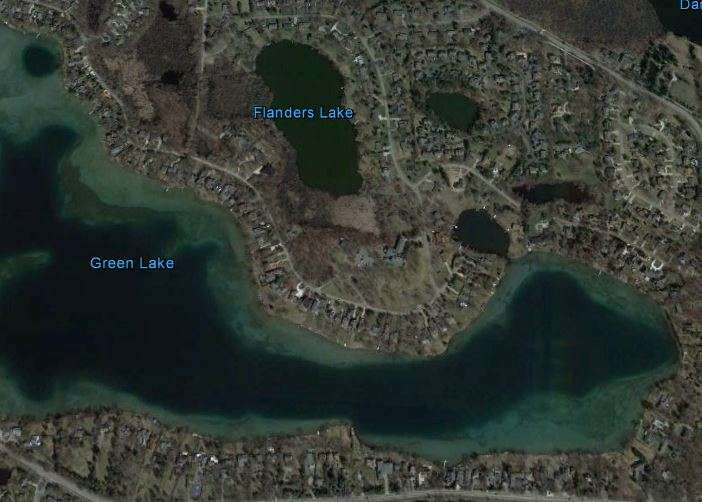 The green from the top of the rise will be about one hundred and sixty yards, but it will be built out into the lake, with only an average sized port from the land side. The second shot will call for a high long shot with tremendous backspin or a tricky running up shot, pitched well short, which will not turn either to the right or, left. For those who fall short of the ridge from the tee it will prove some feat to find the green, although the timid player can play safe and have no difficulty in getting on in three, but those who love a sporty hole will find it particularly appealing. The other classic, the fifteenth, is the second longest hole on the course and is on the opposite side to its rival. It is five hundred and fifty yards in length, a par five. The tee is situated on some rising ground, almost due north of the clubhouse. In front of the tee is about one hundred and fifty yards of low land, filled with what is commonly called American heather. To reach the rising ground on the other side this must be carried in decisive fashion, although the short player may skirt to the left in safety. Having safely driven over the heather, direction will be at a premium on the second shot down the not overly wide plateau, and the third will require equal precision to reach the green, beyond which a row of pines form a soldierly looking background. The course measured 6,443 yards, but with the amount of land the club was situated on, the course likely could have been as long as the members desired. In spite of the predictions, no golf championships were held at Aviation Country Club. It was however, the host of several important early aerial competitions. As the club’s name suggests, it was situated in close proximity to an airport, and the members were very interested in aviation. Among the members was Eddie Rickenbacker, the WWI Ace and Medal of Honor winner. Another member, Colonel Sydney Waldon, flew some of the Wright Brothers early airplanes. A landing field is shown on the 1930 map to the west of the club, at the corner of Union and Willow. Union is now Keith Road, likely named after the E.B. Keith who owned the plot indicated in the upper left of the map. … they have one of the best aviation fields in the country. Hence the name of the club. There are many star aviators among the members, including Eddie Rickenbacker, and it is hoped to encourage aviation as a practical sport. Just how practical flying may be in its relation to country life is well illustrated by the story of a member of this organization who had a very important business appointment in Detroit at five o’clock one afternoon, but found himself two hundred miles away and without a chance of returning by train until long after the hour set. Nothing daunted, he telegraphed his office to take his business friend out to the club—where, promptly at five o’clock, the member arrived via aeroplane, completed the business deal, and permitted his business friend to catch the evening train for home. A newspaper image showing an airplane from the Aviation Country Club fight competition. In March of 1921, the Aviation Country Club of Detroit began plans to host The Pulitzer Trophy Race, a contest which was slated to feature more than 150 airplanes in the preliminary events, with sixty aircraft entered in the Pulitzer Race finals. The event was held September 8, 9 and 10, 1921. It was the second Pulitzer Trophy event (the first was held at Mitchell Field, Long Island on Thanksgiving 1920. The planes flew a triangular course, starting at Selfridge Field (now Selfridge AFB), down to Packard Field, then to Aviation Club’s Field at Green Lake. The distance was set to be identical to the course flown for the Gordon Bennett Airplane Trophy in Paris. 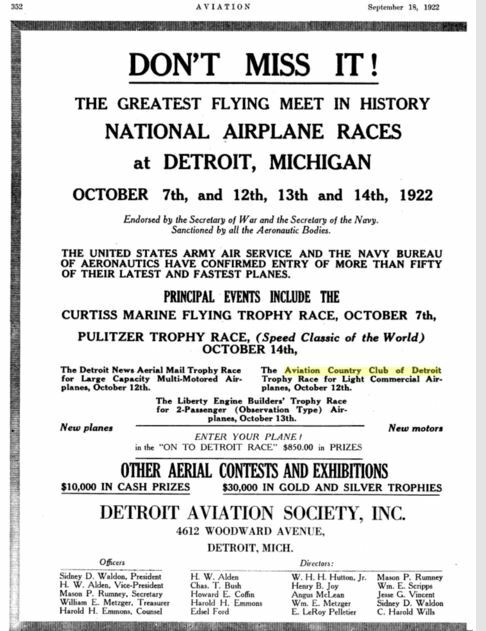 Following this event came the race for the Aviation Country Club of Detroit Trophy, a competition for light commercial planes over the same course as the preceding event, for which six contestants were originally entered and only four started – a LePere, entered by John L. Burns, and a Bristor “Tourer”, entered by the Southwest Airplane Company, being withdrawn. Lieut. R.G. Worthington, Air Service, Army Transport Monoplane T-2, 400 h.p. Liberty engine. J.M Johnson, Vought VE7 Special, 200 h.p. Hispano Suiza engine. C.S. Jones, Curtiss Oriole, 160 h.p. Curtiss C6 engine. Lt. Harold R. Harris, Army Air Service, DH4B “Honeymoon Express,” 400 h.p. Liberty engine. Lieut. Harris, whose plane it was apparent, was the fastest ofy the lot, won an easy victory, his average speed over the course being 134.9 miles per hour. Jones finished second, average speed 109.4 m.p.h., and Lt. Worthington, third, average speed 90.7 m.p.h. Additional races were held in 1923, 1924 and 1925. Plate showing the Aviation Country Club logo. The Aviation Country Club of Detroit apparently featured a biplane. At left is a photo from an Ebay auction of a plate with an ACC Logo. In addition to Eddie Rickenbacker, the Aviation Country Club of Detroit boasted other prominent members, including, apparently, Edsel Ford. A box of Edsel Ford office papers dated to 1926 includes a receipt for the Aviation Country Club of Detroit. Throughout The City of Detroit, Michigan, 1701 – 1922, book listing prominent citizens of Detroit, the Aviation Country Club of Detroit is several times. Members included Orrin De Mass, a well-travelled sportsman and hunter who ran De Mass & Kogelschatz, a high-end tailoring firm; Elwood P. Swan, an investment banker with Woods, Swan and Edwards; William T. Skrzycki, owner of a large bakery and a real estate speculator; Frank Trippensee, an auto body manufacturer; Colonel Sydney Waldon, an engineer with Packard and Cadillac who flew with the Wright Brothers in 1910; and Harry Woods, an investment banker at Woods, Swan & Edwards. In An Account of Oakland County, published in 1925, Frank Vasbinder, a Pontiac contractor is identified as a member. The Local history of Detroit and Wayne County (1928) lists Joseph Croster, president of Crotser Lumber and Fuel; Victor Herbert, an investment banker at Toepel-Herbert; Robert Herndon, a real estate executive and President of Dearborn Hills Golf Club; Ephraim Holmes, president of Consumers Ice and Creamery Company; Charles Leech of Charles Leech Lumber Company; Dr. James Alexander MacMillian of Harper Hospital; and Frederic Tilton, a CPA. These same names are cited in Historic Michigan, Land of the Great Lakes, from 1928. 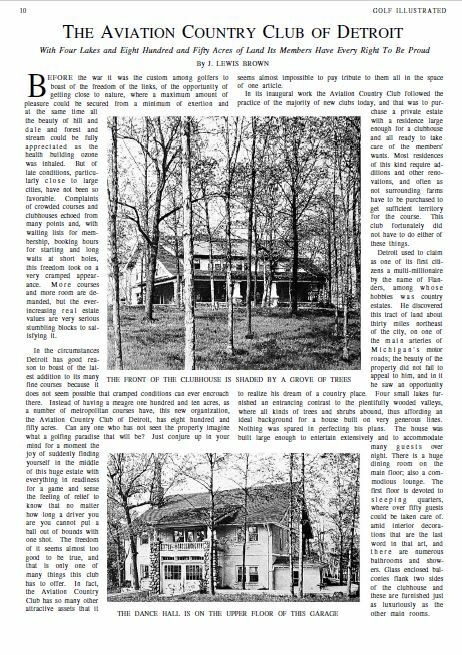 Below are two views of the Aviation Country Club from the Golf Illustrated article. The first looks northwest. Aerial View of Aviation Country Club of Detroit. Aerial view of the Aviation Country Club in 1920. Although I have no evidence, I suspect that the Aviation Country Club of Detroit was a casualty of the Great Depression. The Greater West Bloomfield Historical Society maps show that the club is on the 1930 map, but by 1947, the land has been subdivided. One of the plots of land seems to belong to a Kocsis family. Coincidentally (or perhaps not), the name is the same as Michigan’s greatest amateur golfer, Chuck Kocsis (1913 – 2006). 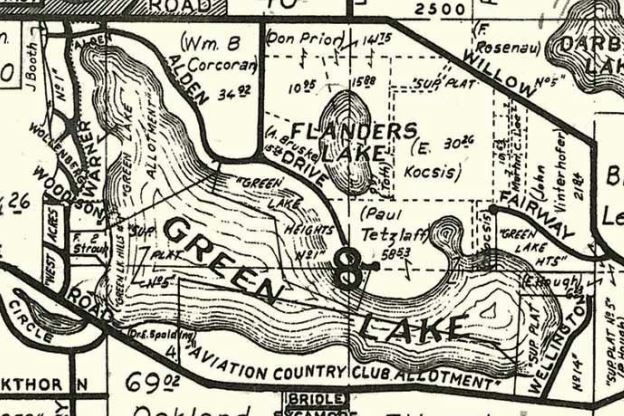 Two other nearby courses, the Orchard Lake Golf Course, a portion of which can be seen in the lower right corner of the 1930 map still exists. So too does the Twin Beach course to the southwest. Tam O’Shanter Country Club, several miles to the southeast is also still running. The Google Earth image of the Aviation Country Club below shows what the property looks like now. 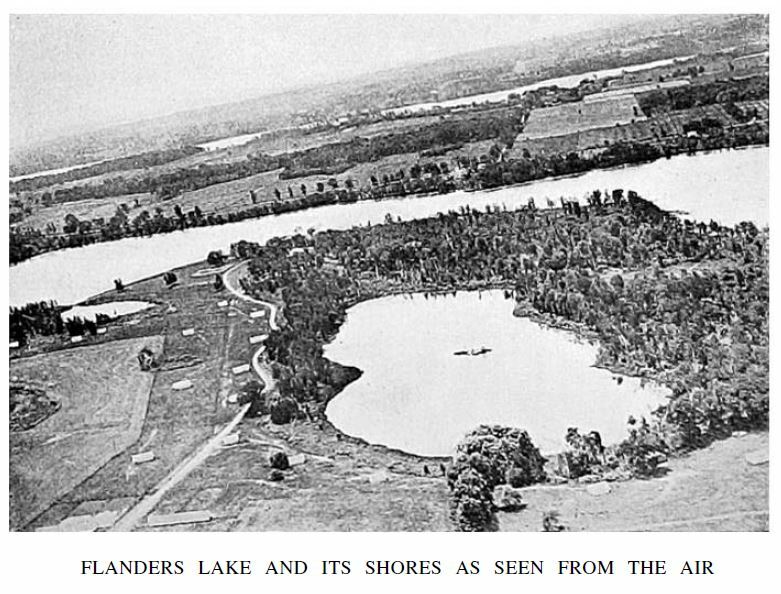 The four lakes referenced in the Golf Illustrated article also show up, although they are not on the 1930 map. 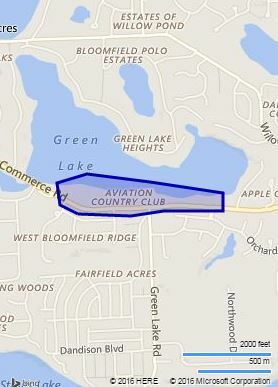 A modern map of the Aviation Country Club location shows just a real estate development the south of Green Lake. The actual property of the course is now Bloomfield Polo Estates and Green Lake Heights. Modern Map of Aviation Country Club location. What did the course look like? And what happened to the course in the end? Perhaps a local historian can fill me in. I have a lot of trophies and I believe quite a few pictures from here from my family, The Hammond’s.